Its latest earnings report offers some reason to be optimistic, but there are a number of things investors need to continue monitoring closely. When beleaguered specialty flooring retailer Lumber Liquidators Holdings Inc. (NYSE:LL) reported earnings on Feb. 21, the market seemed quite pleased, sending shares up almost 17% on the day. And there were definitely a number of things to like. Revenue was up 4.3%. Same-store sales (also called comps) were up 2.8%. Both of these metrics were up in the prior quarter as well, the first time the company has seen consecutive quarterly sales growth in nearly two years. But as much as this seems like the start of a material turnaround, there are still things investors need to keep a close eye on. Lumber Liquidators is struggling to balance high expenses with a slow sales recovery. Image source: Getty Images. Let's take a closer look at Lumber Liquidators' results, and what to expect going forward. Revenue and net income in millions. Data source: Lumber Liquidators. The first thing of note is that, despite a full-year revenue decline and a larger net loss in 2016 than the prior year, Lumber Liquidators did show the aforementioned revenue growth, as well as a reduced net loss in the most-recent quarter. This is a continuation from the third quarter, when the company reported a narrowed loss, on stronger sales than the year before. On the surface, the company's 3% comps growth is a nice move forward after almost two full years of falling sales at existing stores. It was also an acceleration from the third quarter, which saw 1% comps growth. But all comps aren't created equal, and peeling back the layers indicates that the company is still dealing with challenges getting more customers inside its stores. There are two things that drive comps: how many customers come in, and how much they spend. In the third quarter, the company said about half of that was from invoicing more customers and half was from higher average invoices. But in the fourth quarter, the average sale was up 3%, while the number of customers invoiced fell 0.2% from the year-ago quarter. Let's call this good-news, bad-news. On the good side, it would appear the company has made progress with its with product lineup and has been able to reduce the amount of discounting that it has had to do to close business. This had played a big role in the company's losses over the past couple of years, with sharp discounting taking a big bite out of margin. In the latest quarter, Lumber Liquidators' gross margin was 32.9%, up by nearly half from 23% one year ago. The bad news, is that traffic -- measured as paying customers -- has at best, stabilized. There's more, too. On the earnings call, CFO Martin Agard said merchandise sales fell 0.4%, while installation revenue rose 0 74%. In other words, the company sold slightly less flooring but had a lot more customers pay for installation. Expenses remain high. Here's why. In the fourth quarter, sales, general, and administrative expense were 36.6% of sales. This figure was higher than in the year-ago quarter but below the 41.3% of sales for the full year. There are two ways to reduce SG&A impact: Cut costs, and grow sales. Management said that, over time, both of these things will happen. On the cost front, the company reported $3.4 million in legal and professional fees related to ongoing litigation. Eventually the company will be able to conclude this ongoing litigation and its legal expenses will normalize, but it's far from clear how long it will take for that to happen, or the financial impact of any resolution. But that's not the only place Lumber Liquidators is spending more money. On the earnings call, Agard pointed out that SG&A spending when adjusted to exclude these legal and settlement-related fees increased $12.6 million year over year. This adjusted number is important to understand, as it pertains to what the company is spending to operate its stores. And Agard said that, beyond the need for more staffing in the nine new stores opened in 2016, the company was investing more resources in its professional sales and installation teams, compliance, and other corporate capabilities, as well as an increase in advertising expenses. These investments are keys to the company's ability to drive higher sales going forward. As noted, this is starting to pay off with the "do it for me" customer, with installation revenue up 74% in the quarter. At quarter's end, the company only offered installation from two-thirds of its stores, but it plans to have installers servicing all of its stores by year's end. Lumber Liquidators is in a precarious position, still burning more cash than it's generating, but also needing to continue spending to spark growth. This situation showed in the fourth quarter, when the company reported only $10.3 million in cash and a $20 million increase in debt. Inventory jumped $48 million, but accounts payable were $45 million higher. In other words, the company's margin of safety shrank slightly in the period as the company spent more cash on operations and invested in building out its inventory ahead of the 2017 flooring season. On the earnings call, Agard said the debt balance was up another $25 million to address some of those payables, which have come due since the end of the quarter. However, there's a big timing element. Management said this is the biggest inventory-build period and that inventory levels will steadily decline over the course of the year, and that cash from the sale of those products would help the company pay down its revolving credit facility. All told, the company had around $74 million in available liquidity at the time of the earnings call. Lumber Liquidators has seen sales stabilize and is getting growth from its burgeoning installation business. These are positives. But at the same time, the company's ongoing legal issues and investments in growth have it spending a lot more cash than it's bringing in. With $74 million in liquidity available, the company does have time to work through its challenges, and the recent big spend on inventory could position the company to generate positive cash flows sooner rather than later. 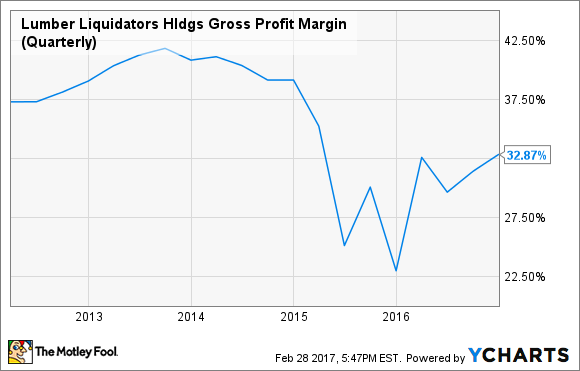 But until ongoing litigation is resolved and there's a clear sign that Lumber Liquidators can live within its own cash flows, investors should probably keep a very close eye on the company.